The U.S. Women’s national soccer team has won three World Cups. The men’s team has won zero. And the women are still paid less. But that pay gap is more complicated than it sounds. In March, five of the best-known players on the Women's team filed an official complaint accusing U.S. Soccer of wage discrimination. The complaint garnered much discussion and debate, as every story about gender pay gap does—but this one has far-reaching implications beyond soccer and beyond sports. The latest wrinkle in the situation came last week, when a federal judge in Chicago, Sharon Coleman, ruled that the team does not have the right to go on strike, which was a particular fear since the Summer Olympics in Rio are just weeks away. The U.S. Soccer Federation (USSF) had filed a lawsuit against the players’ union in February to confirm that because of a “memorandum of understanding,” its current collective bargaining agreement lasts through December 2016, and players cannot strike. The USSF made oral arguments that if the team were to strike during the Olympics, it would damage America’s reputation. Judge Coleman sided with the USSF, but her ruling does not negate the complaint filed in March. Indeed, it is that complaint, rather than the possibility of a strike (the players had not said they intended to strike, but wanted the option), that has lasting significance. Its existence is a stain on the reputation of the USSF. Think about it: the best players (Carli Lloyd, Alex Morgan, Megan Rapinoe, Becky Sauerbrunn, and Hope Solo) on the best women’s sports team in the country (the USWNT has won three World Cups and four Olympic gold medals) believe they are discriminated against by the governing body of their sport. At the very least, it’s bad optics for U.S. soccer, but at the most, the complaint could change similar gender pay gaps in other sports and even in the workplace, where the same issue has been a hot topic for years. "The numbers speak for themselves,” said Hope Solo in an unequivocal statement released at the time of the complaint. “We are the best in the world… the USMNT get paid more just to show up than we get paid to win major championships." The USSF begs to differ. In an official response to the March complaint, it pointed out that the players bringing the complaint, “earned more money from U.S. Soccer last yer than every single member of the MNT." 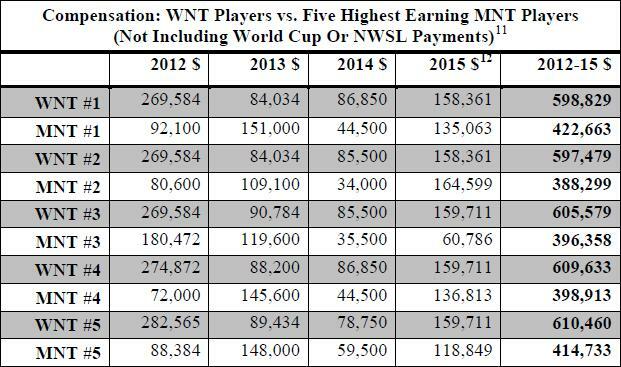 The organization cited two key tables in its arguments that compare the five highest-earning men’s players with the five highest-earning women’s players over the four-year period from 2012 to 2015. One table (above) shows that the top five women actually made more than the top five men. But that does not include bonuses the men receive from playing in the World Cup. A second table showed that when World Cup bonuses were included, the men made 3.8% more. That “only” is a problem. A difference of 3.8% is not insignificant, and the argument the women are making is that there shouldn’t be any difference. But more importantly, many argue, you must examine the pay of the entire squad, not just the top stars. Once you expand the sample size, as the New York Times did, you find that the 50th-highest-paid man made $246,238 in total since 2008, nearly 10 times the $25,516 that the 50th-highest-paid woman made. That is a staggering gap. Former USWNT player: 3.8% is "a huge difference"
And the entire point of the complaint brought by the recognizable stars is to narrow the gap for all the players, even down to those who aren’t household names—players like, say, Kate Deines. Deines (pronounced “DIE-niss”) played professional soccer for three years, including with the Under-23 Women’s National Team. She played with stars like Lloyd, Rapinoe and Solo. Then she played with the Seattle Reign, part of the National Women’s Soccer League. But she chose to retire from the sport last year, at just 25, because she couldn’t make a living in it. Facing the possibility of a $25,000 salary, she went to graduate school for a master’s degree in finance, and is currently working part-time at Seattle investment firm, Avier Wealth Advisors. “Soccer wasn’t a long-term financially viable situation for me in the long run, which is sad,” Deines told Yahoo Finance in a visit to our New York studios. "So I had to make a tough decision." The disparity is caused by complicated differences in the way the women and men are paid. For regular games, the women receive a base salary of $3,600 per game plus a $1,350 bonus only if they win; the men receive a base of $5,000 just for playing, and another, much bigger bonus of $8,166 for winning. As the New York Times showed in an eye-popping graphic, if the women's team were to win 20 exhibition matches (or "friendlies"), each starter would earn $99,000. Men's team members would earn $352,500 for doing the same—and would earn $100,000 even if they lost all 20. The USSF points out that the men’s team brings in more game revenue than the women’s team. That was always true, until last year, when the women won their World Cup in dominant fashion and the revenue of the women’s team spiked to $23 million, with a profit of $6.6 million. The men’s team made a profit of less than $2 million. For this year, with high hopes for another Olympic gold, a USSF budget report again projects more revenue and profit from the women: $17.5 million in projected revenue and $5 million in profit from the women, vs. $9 million in projected revenue and a loss of $1 million from the men. It could be more than cool. You might see women in the workplace follow the soccer stars’ lead: According to the latest data from the General Accounting Office (GAO), women on average still earn 80 cents for every $1 a man earns. Black and Hispanic women earn less than that. For more from Deines, watch the above video, part of our ongoing Sportsbook series.